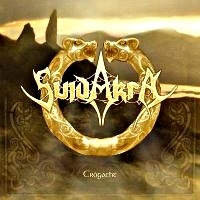 After the intro the song "Conlaoch" immediately reveals the power of Suidakra and sets the course for the rest of the album. Their melodic death metal with some Gothenburg roots combined with Highland bagpipes and whistles make them rather original. The combination with some folk parts in "Isle of Skye" is also perfectly arranged. Starting with bagpipes the fourth song "Scáthach" continues in a kind of In Flames style. The combination of the raw Mikael Stanne (Dark Tranquility) like vocals with some clean parts are not very original, but when used, they suit the songs. The song "Feats of War" is an Irish folk song with female vocals of Tina Stabel. After their successful record 'Caledonia' the band fortunately introduced some new elements in their songs. I already mentioned the traditional instruments such as bagpipes, tin whistles and in "Baile's Strand" they have come up with a sixteen member choir. Standstill is decline, that can not be said of the new Suidakra. With the new elements and the original epic orchestral arrangements in some songs they once again takes a step forward. In my opinion they are still evolving. The combination of the artwork and the fitting lyrics about Irish mythology makes this album a complete experience. When you buy the digipack you get a 16-page booklet included. A well-done job by this German Celtic metalheads.